Among HLA-DP specificities, HLA-DP4 specificity involves at least two molecules, HLA-DPA1*0103/DPB1*0401 (DP401) and HLA-DPA1*0103/DPB1*0402 (DP402), which differ from each other by only three residues. Together, they are present worldwide at an allelic frequency of 20–60% and are the most abundant human HLA II alleles. Strikingly, the peptide-binding specificities of these molecules have never been investigated. Hence, in this study, we report the peptide-binding motifs of both molecules. We first set up a binding assay specific for the immunopurified HLA-DP4 molecules. Using multiple sets of synthetic peptides, we successfully defined the amino acid preferences of the anchor residues. With these assays, we were also able to identify new peptide ligands from allergens and viral and tumor Ags. DP401 and DP402 exhibit very similar patterns of recognition in agreement with molecular modeling of the complexes. Pockets P1 and P6 accommodate the main anchor residues and interestingly contain only two polymorphic residues, β86 and β11, respectively. Both positions are almost dimorphic and thus produce a limited number of pocket combinations. Taken together, our results support the existence of three main binding supertypes among HLA-DP molecules and should significantly contribute to the identification of universal epitopes to be used in peptide-based vaccines for cancer, as well as for allergic or infectious diseases. In humans, the three molecules HLA-DR, HLA-DQ, and HLA-DP present antigenic peptides to CD4+ T lymphocytes. They are each composed of two separate α- and β-chains, which assemble into a very similar structure (1, 2). Assembly of the N-terminal domain of both chains forms the peptide-binding site, which is composed of two α helices standing above an eight-stranded β sheet floor. Conserved residues present in the binding site compose a hydrogen bond network with the peptide backbone. They impose on the peptide an extended conformation and sustain the broad peptide-binding specificity of the HLA II molecules. Nevertheless, these molecules possess their own peptide-binding selectivity (3, 4). This is due to the polymorphic residues, which mainly lie within the binding site. They have been distributed into five specificity pockets, which accommodate the peptide amino acids numbered P1, P4, P6, P7, and P9 (1). Analyses of a wide spectrum of naturally bound peptides and of synthetic analogs have identified peptide-binding motifs and amino acid preferences for multiple HLA II molecules (3, 4). These motifs generally correlate with the content of the specificity pockets, allowing a detailed documentation of HLA II molecules. Mainly HLA-DR and HLA-DQ have been investigated and appear to be drastically different from each other. HLA-DR molecules are well known to accommodate aromatic and hydrophobic residues, especially in the P1 pocket (4, 5, 6, 7), while HLA-DQ molecules generally accept relatively short side chains (8). The differences appear less important between molecules encoded by the same locus (9). Comparison of the repertoire of binding peptides shows that HLA-DR molecules share common binding properties and hence can be assembled into HLA II supertypes (6, 7). This degenerated specificity allows the discovery of promiscuous peptides, which bind to multiple HLA II molecules, and greatly enhances the potential for the use of epitope-based vaccines (10, 11, 12, 13, 14, 15). Supertypes were initially described for the class I molecules (16, 17, 18) and only attributed to HLA-DR molecules for the class II molecules (6, 7), probably because they are the most investigated molecules. In fact, the HLA-DP molecules have scarcely been studied. Initially, they appeared less important in the immune response than HLA-DR and HLA-DQ molecules, because HLA-DP incompatibility did not seem to contribute to the risk of graft-vs-host disease (GVHD)3 (19, 20). However, a single mismatch is now known to suffice in triggering a specific T cell response after bone marrow transfer, confirming the whole functionality of these molecules (21). Both the α- and β-chains of HLA-DP molecules are polymorphic molecules allowing multiple combinations of the 17 HLA-DPA1 and 86 DPB1 allelic forms (22). However, only a limited number of HLA-DP molecules are abundant in the worldwide population, the molecule DPA1*0103/DPB1*0401 (DP401) being overrepresented (22). This molecule differs by only three aa from the DPA1*0103/DPB1*0402 (DP402) molecule, which is also frequently encountered (Table I⇓). Together, both molecules have a gene frequency of 50% in Europe, 60% in South America, 80% in North America, 60% in India, 25% in Africa, and only 15% in Japan (22). In the Caucasian population, they are carried by ∼76% of individuals and hence are as frequent as the well-known HLA-A2 molecule. In comparison, approximately six molecules of HLA-DR are required to cover the same percentage of people. Therefore, we could expect that peptides that efficiently bind to DP401 and DP402 will have a large impact as epitope-based vaccines. However, although multiple clones or T cell lines of various peptide specificities are restricted to HLA-DP4 (23, 24, 25, 26, 27, 28, 29, 30), the binding specificity of HLA-DP4 molecules remains unknown. To our knowledge, only the peptide specificities of HLA-DP2 and HLA-DP9 molecules have been investigated (31, 32), and only preliminary data of naturally processed peptides eluted from a DP4 molecule have been reported (33). Therefore, we used specific binding assays to describe the peptide-binding motif of the HLA-DP4 molecules and to demonstrate that they define a new peptide specificity supertype. Peptides were synthesized as previously described (7) and were purified by reversed-phase HPLC on a C18 Vydac column (Interchim, Montluçon, France). Mutated peptides were used without purification, because they did not exhibit >10% contaminants in analytical HPLC. The NY-ESO-1-derived peptides (119–143 and 158–166) and MART-1/Melan-A peptides (1–20, 41–60, 51–73, 62–72, and 103–118) were synthesized using standard F-moc chemistry by the University of Pittsburgh Peptide Synthesis Facility (shared resource) as described previously (34). The biotinylated Oxy (bOxy) peptide 271–287 was biotinylated with biotinyl-6-aminocaproic acid (Fluka Chimie, St. Quentin Fallavier, France) on the N terminus before cleavage from the resin and HPLC purification. Quality of the peptides was assessed by electrospray mass spectroscopy. The peptides encompassing the sequence of the major bee venom are the following: 1–18, 5–22, 9–26, 13–30,17–34, 21–38, 25–42, 29–46, 33–50, 37–54, 41–58, 45–62, 49–66, 53–70, 57–74, 61–78, 65–82, 69–86, 73–90, 77–94, 81–98, 85–102, 89–106, 93–110, 97–114, 101–118, 105–122, 109–126, 113–130, and 117–134. Those covering the sequence of the Nef HIV-1/LAI protein are the following: 1–36, 25–39, 37–71, 66–94, 86–100, 100–114, 113–128, 117–132, 132–147, 137–168, 155–185, 175–190, and 182–198. EBV homozygous cell lines PITOUT (DPA1*0103, DPB1*0401), HHKB (DPA1*0103, DPB1*0401), HOM2 (DPA1*0103, DPB1*0401), and SCHU (DPA1*0103, DPB1*0402) were used as sources of human HLA-DP4 molecules. They were cultured up to 5 × 109 cells in RPMI 1640 medium supplemented by 10% FCS, 2 mM glutamine, 1 mM sodium pyruvate, 500 μg/ml gentamicin, and 1% nonessential amino acids (Sigma-Aldrich, St. Quentin Fallavier, France). B7/21 hybridoma was a kind gift from Dr. Y. van de Wal (Department of Immunohematology and Blood Bank, Leiden University Medical Center, Leiden, The Netherlands). It was cultured in DMEM supplemented by 10% FCS, 2 mM glutamine, 1 mM sodium pyruvate, 500 μg/ml gentamicin, 1% nonessential amino acids, 10 mM HEPES, and 50 μM 2-ME (Sigma-Aldrich). Abs were purified by immunoaffinity on protein A-Sepharose as recommended by the manufacturer (Pharmacia, Orsay, France). HLA-DP4 molecules were purified by affinity chromatography using B7/21 mAb (35) coupled to protein A-Sepharose CL 4B gel (Pharmacia) as described previously for L243 mAb (7). Binding assays were based on previously published protocols (8, 32, 36). Briefly, they were performed in 10 mM phosphate, 150 mM NaCl, 1 mM n-dodecyl β-d-maltoside, 10 mM citrate, and 0.003% thimerosal (pH 5) buffer with 10 nM of bOxy271–287, an appropriate dilution of HLA-DP4 molecules (∼0.1 μg/ml), and serial mid-dilutions of competitor peptides. After 24-h incubation at 37°C, samples were neutralized and applied to B7/21-coated plates for 2 h. Bound biotinylated peptide was detected by means of streptavidin-alkaline phosphatase conjugate (Amersham, Little Chalfont, U.K.), and 4-methylumbelliferyl phosphate substrate (Sigma-Aldrich). Emitted fluorescence was measured at 450 nm upon excitation at 365 nm in a Victor II spectrofluorometer (PerkinElmer Instruments, Les Ulis, France). Data were expressed as the peptide concentration that prevented binding of 50% of the labeled peptide (IC50). IC50 values of the Oxy271–287 peptides served as reference in each experiment. HLA-DP4/Oxy complex was built by amino replacement from the DR1-HA complex (Brookhaven Protein Data Bank accession code 1dlh), most (∼100) of the residues to be replaced being surface residues. The water molecules buried in the DR1-HA complex were first removed because of obvious clashes when left during residue replacements. Great care was taken to minimize perturbation of residues and backbone in the surroundings of the replaced residues. This was done by gently and progressively propagating the perturbation using the following procedure: 1) the replaced residue was accommodated by alternating energy minimization and low temperature (10–50 K) dynamics with the rest of the protein held fixed; 2) the neighboring residues in contact with the replaced residue were subjected to the same treatment; and 3) both the replaced residue and its neighbors were minimized again with the rest of the protein held fixed. When all the required replacements were completed, the whole DP4 protein obtained was thoroughly minimized (1000 steps) to anneal the small remaining strains. Except for the region where two residues were deleted (deletion of residues 23–24 in the β-chain), the DP4 structure was found to be very similar to the original DR1 structure. The Sybyl program (Tripos Associates, St. Louis, MO) was used for this work. After a round of screening of biotinylated peptides, we selected the Oxy271–287 peptide to establish binding conditions for both DP401 and DP402 molecules. This peptide has been sequenced from naturally processed peptides eluted from DPA1*0201/DPB1*0401 molecules (33) and presents 100% identity with a fragment of the oxytocinase protein (GenPept accession code U62769). As shown in Fig. 1⇓, a concentration range of the nonbiotinylated Oxy271–287 peptide totally inhibits the binding of its biotinylated form to both molecules, thus demonstrating the peptide interaction specificity. The mid-inhibition occurred at ∼10 nM concentration. In this assay, the binding specificity for the HLA-DP4 molecules was ensured by the known specificity of the B7/21 Ab (35). It was used to immunopurify the HLA-DP4 molecules and to trap them onto ELISA plates. Nevertheless, we also assessed that other peptides known to bind HLA-DP4 molecules were equally good binders in our assays. The HLA-DP4 eluted peptide IL3R127–146 (33) and the T cell epitopes MAGE3245–268 (28), HSV283–302 (29), NSP2 (24), and tetanus toxoid (TT) peptide 947–963 (26) inhibited the binding at different levels of efficiency. In sharp contrast, the HA306–318 peptide, which is known to bind efficiently to multiple HLA-DR molecules (5, 37), and the peptides HCI46–63 and DQB43–57, which bind efficiently to HLA-DQ molecules (38), were totally inactive. Inhibition of peptide binding to DP401 and DP402. bOxy271–287 (10 nM) was incubated with a dilution of DP401 (upper panel) or DP402 (lower panel) and various dilutions of peptides to be tested. Complexes were revealed on ELISA plates previously coated with B7/21 Ab. Staining was performed using streptavidin-phosphatase and a fluorescent substrate. Data presented are representative of two independent experiments. Using these assays, a set of overlapping and truncated peptides was used to delineate more precisely the interacting region of the Oxy271–287 peptide (Table II⇓). Three 13-mer peptides (271–283, 272–284, 273–285) were as active as the native peptide on both molecules, suggesting that the core region extended from K273 to L283. Moreover, removal of F275 was associated with a large decrease in the binding, suggesting that this position played a major role in the interaction. Accordingly, alanine (Oxy F275A) and lysine (Oxy F275K) substitution of this position altered the peptide’s ability to bind to DP401 (Table III⇓). The same dramatic effect was seen toward DP402 with F5K but not with F5A. Interestingly, substitutions by either alanine or lysine of a second phenylalanine (F280) strongly affected the binding for both molecules. This residue appeared as the main anchoring residue. Finally, substitution of L283 by a lysine diminished the binding to both DP401 and DP402, while substitution of T278 by a lysine only slightly altered the binding to DP401. Three residues, F275, F280 (I + 5), and L283 (I + 8), therefore appeared as anchor residues and this pattern suggested strongly that they were accommodated by both HLA-DP4 molecules in the P1, P6, and P9 pockets, respectively (1). This was in agreement with the molecular modeling of the peptide Oxy273–285 bound to DP401 and DP402 (Fig. 2⇓ and see below). We thus synthesized a novel set of peptides substituted at these positions to investigate the amino acids preferences of each pocket (Table IV⇓). In the P1 and P6 pockets, conservative substitutions were well tolerated in sharp contrast to substitutions by E, N, and T. In the P4 pocket, only small effects were observed, while significant but moderate binding loss was found in the P9 pocket. Slight differences were observed between DP401 and DP402 as exemplified by substitutions with basic residues in the P4 pockets, N in the P1 and Y in the P9. However, as summarized in Table V⇓, DP401 and DP402 exhibit a similar binding motif mainly characterized by the existence of two main anchor residues in the P1 and P6 pockets. Specificity pockets of HLA-DR1/HA (A) and HLA-DP4/Oxy (B) complexes. 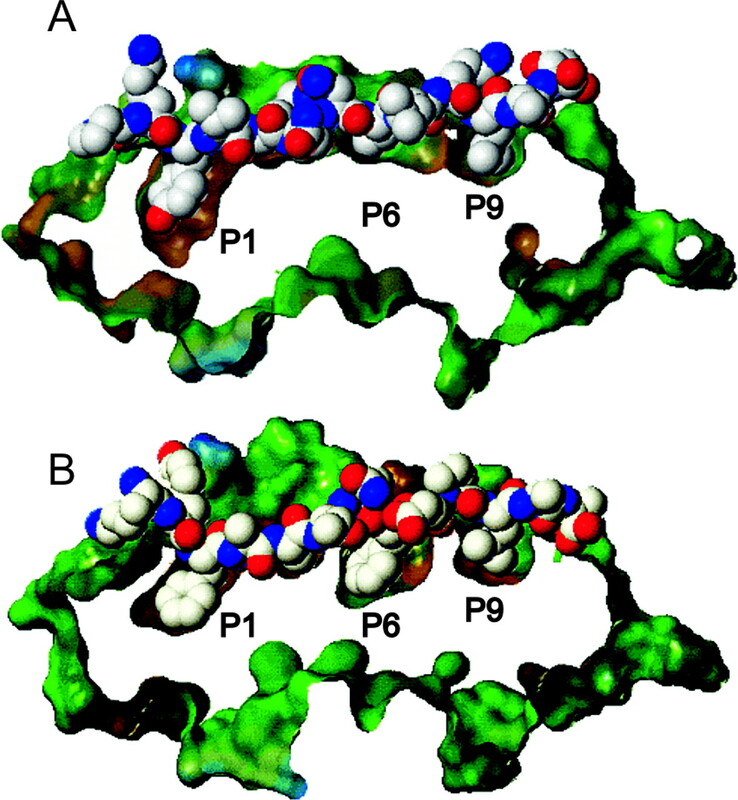 The side views of the HLA molecules show the size disparity of the pockets. Surface HLA molecules are in green and brown to represent hydrophilic or hydrophobic areas, respectively. Peptides are in space filling representation (C in white, O in red, and N in blue). We then modeled the complexes of the peptide Oxy273–285 with DP401 and DP402 on the basis of HLA-DR1/HA306–318 crystallographic data (1) (Brookhaven Protein Data Bank accession code 1dlh). As illustrated in Fig. 2⇑, HLA-DP4 seems to possess a large aromatic cavity in the N-terminal part of the bound peptide. There are only two major replacements between HLA-DR1 and HLA-DP4, which are in the exterior lateral side of the pocket: DR1-αAla52 to DP4-αF52 and DR1-βPhe89 to DP4-βMet89. These mutations do not modify the size or hydrophobic character of this pocket, but the Oxy-Phe275 seems to be more deeply buried in HLA-DP4 than the longer HA-Tyr308 in HLA-DR1. In sharp contrast, the P6 pocket looks very different in the two models HLA-DP401 and DP402/Oxy as compared with the complex HLA-DR1/HA. This pocket is quite shallow in HLA-DR1 because of the large side-chain floor residue βL11, while it is deep in the models of DP401 and DP402 because of the small floor residue βG11. The sole difference between DP401 and DP402 resides in the P9 and stays principally in the mutations DP401-A38 to DP402-V38 and DP401-A57 to DP402-D57, the position 58 being outside the binding groove. The mutation DP401-A57 to DP402-D57 seems to create a similar hydrogen bond network to that found in the P9 pocket of HLA-DR1. In these models, we also observed the presence of buried water molecules and a lower number of hydrogen bonds with the peptide as compared with the HLA-DR1 molecule (data not shown). As a result, the HLA-DP4/Oxy model strongly suggests the existence of two large aromatic pockets (P1 and P6), which may account for our binding observations that aromatic/hydrophobic amino acids at these positions serve as anchor residues. We then assessed the relevance of the HLA-DP4 motifs in peptides different from the Oxy peptides in relation with their capacity to bind to HLA-DP4 molecules. We first aligned the sequences of the good DP4 binders that we described in Fig. 1⇑: IL3R127–146 (33), MAGE3245–268 (28), HSV283–302 (29), NSP2 (24), and TT947–963 (26) (Table VI⇓). Only the NSP2 peptide did not exhibit the HLA-DP4 motif although it bound efficiently to HLA-DP4 molecules. The motif was also found in the active peptide NY-ESO-1158–180, which we also retained for this study, because it stimulated a HLA-DP4-restricted T cell clone (30). We then looked for the presence of the binding motif in unselected sets of peptides. In the 30 peptides that encompassed the whole sequence of the major bee venom allergen, 4 peptides (API m1 73–90, 77–94, 81–98, and 117–134) had the motif. Two of them (77–94 and 81–98) were found active but with different level of activity (Table VI⇓). In the 13 peptides that entirely covered the HIV Nef protein, only the peptide Nef66–94 possessed the motif and bound to the HLA-DP4 molecules. However, a second peptide (Nef132–147) also bound to HLA-DP4 molecules but harbored a partial binding motif only. None of the 4 peptides from MART-1/Melan-A exhibited the motif and only 1 peptide (MART-151–73) displayed a weak activity. Finally, the motif was also found in the peptide NY-ESO-1119–143 (34). It exhibited a good binding activity. As a result, from the 13 binders we identify, 10 contain the motif in their sequence. Reciprocally, 2 peptides contain the binding motif but did not bind to HLA-DP4 molecules. Forty peptides have no binding motif and no activity. We also found few discrepancies between DP401 and DP402, strongly suggesting that both molecules share very similar anchor residues in the P1, P6, and P9 positions. In this study, we report the peptide-binding motifs of HLA-DP4 molecules, which are the prevalent HLA II molecules in the worldwide population. These motifs have been deduced from binding activities of analogs and slightly differ from that previously proposed from sequence alignment of a few peptides eluted from the molecule DPA1*0201/DPB1*0401 (33). They mainly seem to depend on two large and hydrophobic pockets: P1 and P6. In the HLA-DP4 models, the P1 pocket accommodates aromatic and aliphatic residues in exactly the same manner as HLA-DR molecules do (1, 3, 4). The P6 pocket in the models of HLA-DP4 molecules appears larger because of the small side-chain glycine residue at position β11 as numbered by alignment with DRB1. It also accepts large aromatic and aliphatic residues. As compared with HLA-DR molecules, this pocket might be more hydrophobic as a result of the replacement of αD66 and αE11 in DRB1*0101 by αL66 and αA11 residues. This is probably why a glycine at position β11 does not favor aromatic or hydrophobic residues in HLA-DR molecules as illustrated by the P6 specificity of DRB1*0701 (4). Therefore, structural characteristics of the P1 and P6 pockets appear to account for amino acid preferences observed in the binding assays specific for HLA-DP4. Moreover, HLA-DP401 and -DP402 molecules differ by only three substitutions, which reside in the P9 pocket and which do not provoke major changes in the amino acid preferences of this pocket. Therefore, it is not surprising that they share very similar binding motifs. Based on the computer model of HLA-DP4 molecules, the P1 and P6 pockets contain only two polymorphic positions, β86 and β11, respectively. Both positions are almost dimorphic: β86 is either a glycine or an aspartate while β11 is either a glycine or a leucine. Therefore, amino acid preferences in the P1 and P6 pockets are expected to be controlled by a limited number of key amino acid combinations. Thus, we propose a supertype subdivision of the HLA-DP molecules based on the β11 and β86 positions. DPB1*0402 differs from DPB1*0201 by only one aa at position β71 as numbered by alignment with DRB1 in the peptide-binding groove. As this position resides in the P4 pocket, it does not modify the amino preferences in the P1 and P6 pockets. Accordingly, the motif HLA-DP2 exhibits exactly the same amino acid preferences in these pockets as HLA-DP4 (32). It differs only slightly from HLA-DP4 by the residues accommodated by the P4 pocket. More precisely, a sequence alignment suggests that the amino acids preferred in this pocket act as hydrogen bond donors in HLA-DP2 (32), as agreed by the modeling of HLA-DP/Oxy complex (data not shown). Moreover, the same substitution at the position β71 exists between the molecules DRB1*0401 and DRB1*0402 and has been shown to account for most of the few binding discrepancies between these two HLA-DR4 allotypes (39). Thus, as the major binding effects result from P1 and P6 substitutions in both HLA-DP2 and HLA-DP4, these molecules are expected to share a common repertoire of peptides and hence to form a supertype of HLA II molecules. In sharp contrast, the HLA-DP9 molecule seems to belong to another supertype (31). This molecule exhibits a totally different motif as a positively charged residue and a short/hydrophobic residue serve as primary anchor in the P1 and P6 pockets, respectively (31). This motif is nicely associated with the presence of a negatively charged aspartate at position β86 in the P1 pocket and with the reduced size of the P6 pocket, in which is buried a leucine at position β11. Therefore, based on these observations, we could speculate that HLA-DP molecules are distributed into three main binding supertypes defined by the following combinations of key amino acids: βG11 βG86, βG11 βD86, and βL11 βD86. We can outline that β86 in HLA-DR molecules is also dimorphic and is occupied by a valine or a glycine. It is known to control the P1 anchor residue (3, 4, 40) and to contribute to the dimer stability of HLA II molecules (41). It has also been identified as a key position that segregates the preponderant alleles upon different binding modes (4, 5, 7). Moreover, as an unexpected consequence, our data may provide new insights into the allogenic reactivity of HLA-DP and their debated role in GVHD. It is known that HLA-DP incompatibility only leads to low mixed lymphocyte reaction. Accordingly, the HLA-DPB1 disparity was not initially found to influence the risk of acute GVHD (19, 20). Recent studies performed on HLA-A, -B, -DR, and -DQ identical pairs demonstrated its role in the graft outcomes (34, 42) as agreed by isolation of allogenic T cell clones (21). However, the authors concluded that not all HLA-DP incompatibilities elicit a measurable MLR response (42). Therefore, HLA-DP appears to be of less importance in comparison with other HLA II molecules. It is tempting to discuss these observations in the light of our binding data. We suggest that the repertoire of natural peptides that bind to HLA-DP molecules is preferentially circumscribed by the amino acid combination at positions β11 and β86. Although HLA-DP2 and HLA-DP4 did not exhibit evident common peptides (32, 33) and differ by the β71 which appeared to be involved in allorecognition (42), subsets of HLA-DP molecules from the same supertype may have in common a large number of naturally presented peptides. In this context, precursors of allogeneic T cells might be low in number as a result of negative thymic selection and hence rarely give rise to graft rejection. In contrast, HLA-DP from different supertypes would be fully allogeneic. The binding assays presented in this paper constitute a promising way of selecting peptides for vaccination. Peptide-based strategies of vaccination generally use HLA-DR-restricted peptides as TT830–843 (43) or PADRE peptide (13) to trigger a specific immune response. Such peptides have been primarily selected, because they are able to bind multiple HLA-DR molecules and hence are expected to be active in most individuals. Therefore, much effort has been devoted to finding such peptides in pathogens (11, 15, 44, 45), allergens (7, 46), and tumor Ags (34, 47). As outlined previously (28, 30), HLA-DP4 are present in ∼75% of Caucasians. Their frequency is equivalent to that of the well-known class I molecule HLA-A2 (22). Therefore, HLA-DP4-restricted peptides have a similar impact in the Caucasian population to HLA-DR peptides that bind approximately six different HLA-DR molecules. We can also notice that all the immunodominant HLA-DP4-restricted peptides that have been delineated by others using T cell lines or clones are included in the best peptide binders found by our assays (24, 26, 28, 29, 30). Among them, NY-ESO-1158–180 seems to promote a T cell response that supports the humoral response against NY-ESO-1 (30). Therefore, HLA-DP4-restricted T cells appear as active as HLA-DR-restricted T cells to provide a helper activity. Together, these observations support the use of HLA-DP4-specific binding assays to delineate new sequences for vaccination. As the HLA-DP4-specific motifs clearly differ from that of HLA-DR molecules, these peptides could nicely complement the HLA-DR-restricted peptides in a multiepitopic strategy and hence diminish the risk of pathogen evasion. In particular, in this study, we propose new sequences from the major bee venom allergen, which could be used in specific immunotherapy of patients allergic to bee venom (7), from the HIV Nef protein and the melanoma Ag NY-ESO-1, which could be included in a peptide vaccine (34, 48). However, as compared with investigations of HLA-DR molecules, we identified fewer active peptides (7, 34, 49). This might result from the two constraints imposed on the P1 and P6 pockets and may suggest that HLA-DP4 epitopes are rarer than HLA-DR epitopes. Therefore, considering their frequency in the worldwide population, these epitopes are of great value for vaccination and constitute an alternative to the preparation of universal T cell epitopes. We are grateful to Drs. P. Van den Bruggen (Ludwig Institute, Brussels, Belgium) and D. Koelle (University of Washington, Seattle, WA) for communicating the sequences of the peptides MAGE3 and HSV, respectively, before publication. We thank Dr. Y. van de Wal for the gift of B7/21 hybridoma and Dr. de Toma and Prof. J. Dausset (Centre d’Étude du Polymorphisme Humain, Paris, France) for the gift of HHKB and PITOUT cell lines. ↵1 This work has been supported by the Commissariat à l’Energie Atomique, SEDAC Therapeutics, and grants from l’Agence National de Recherche sur le Sida et l’Etablissement Français des Greffes. ↵3 Abbreviations used in this paper: GVHD, graft-vs-host disease; DP401, DPA1*0103/DPB1*0401; DP402, DPA1*0103/DPB1*0402; bOxy, biotinylated Oxy; TT, tetanus toxoid. Charron, D., R. Fauchet, E. Albert, J. Bodmer, A. Cambon-Thomsen, L. Degos, J. Hors, A. Piazza, I. Schreuder. 1997. Genetic diversity of HLA, functional and medical implication. D. Charron, ed. XIIth International Histocompatibility Workshop and Conference EDK, Paris.